Thanks to the evolution of such parties into theme parties. Here we have mexican christmas party ideas, and mexican christmas party games. This year, consider throwing a Mexican themed Christmas party! We are all fearful of being put on turkey duty. Some of us take the easy route out and just order one, some of us decide to go all out to impress the boss and just cook one ourselves. Ever wondered how you could have spent all those time fighting with someone over the last butterball instead? Cooking up a Mexican feast of course! In a pitcher combine the sliced fruit, juice and champagne. Serve chilled and enjoy! This. Because who wouldn’t want a taco hat at a Christmas party. Or if you find that making a taco hat is too advanced for your cooking skill level, consider a DIY taco bar. That way the coworker that hates guac (who does?!) or the co­worker that does not fancy lime on their taco (again, who does?!) wouldn’t have anything to complain about while stuffing their face with their own personalized tacos. Nobody wants the present you got last year which you hate and decided to re­gift. With a Mexican themed Christmas party, there is something for everyone without going through what you threw into the rejected gift pile. For the art lovers, a colorful framed painting would be the perfect gift. Not forgetting the coworkers who are big fans of lucha libre, a nacho libre mask could just be on their wish list. Also, over at Mexican ponchos, there is a wide array of ponchos for even the pickiest of your colleagues. For the ladies, how about a bohemian poncho? Great for camping trips or even for when the office gets a little chilly. For the guys looking to channel a little “Man with No Name”, the Clint Eastwood poncho would be perfect for them. And for fans of The Walking Dead, there is of course, “The Walking Dead poncho”. I don’t know about you but I sure would like to get my hands on one of these. The standard office Christmas decor consists of a small to mid sized Christmas tree and the hideous, and I say hideous snowflakes that your coworkers spend their free time halfheartedly hanging from the office ceiling. Also, recycled stockings from last year. And the year before. This year, how about getting everybody involved in decorating by doing something fun and interesting? For starters, gather all your sombreros because the fir is out and the sombreros are in! 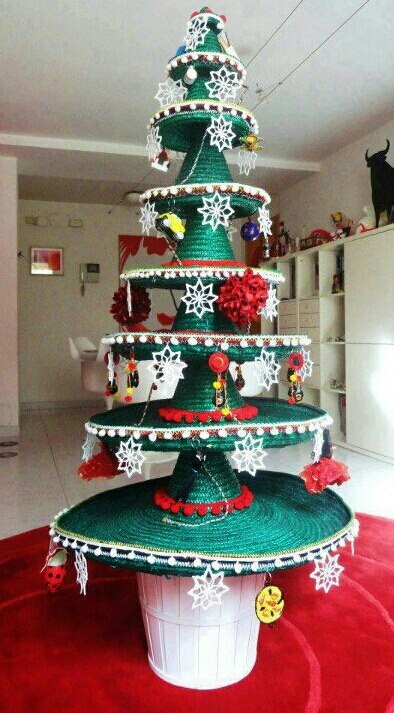 This year, DIY your own Christmas tree with sombreros that are painted green. Tassels and snowflakes can be bought from your local bookstore or any decor stores to make sure it still looks like the Christmas in your Mexican themed Christmas party. 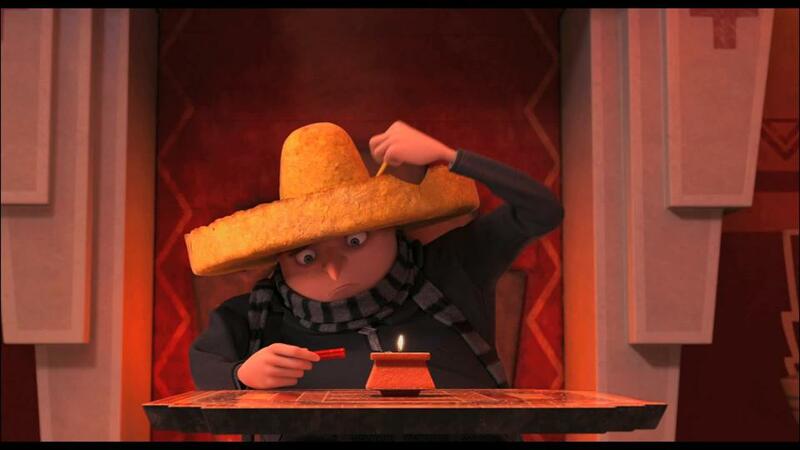 Also, the sombreros can do more than just replace the Christmas tree. Think of presents in your recycled stockings from eons ago. Gross? Now think of presents in your very own sombrero! What about these DIY fiesta garland that are easy to make and fun to look at, and will put a personal spin on the office decor? Best part is they don’t even have to be taken down after Christmas and they’ll still fit in nicely with your desk decorations. Just be sure to ask your boss for permission first (even better, ask him to join in)! What is a fiesta without a pinata? Instead of one in the shape of a donkey, get one in the shape of a reindeer to make it fit into your party seamlessly. Ditch the candies and fill with with adult stuff such as gift cards or tea bags, let your mind run wild and the possibilities are endless. Once everything is set up, watch your coworkers’ months worth of pent up frustration unleash! Here’s a tip, stand far away and arm yourself with a cup of sangria and a camera. Hilarity ensues.